I love going out for the day at the weekend, especially when the sun decides to come out! Since working for Café Reality, I have picked up the habit of scouting for furniture, checking what “looks” cafes, restaurants and bistros are going for these days and what type of furniture ranges they are using to achieve these styles… It drives my friends crazy! Recently, the re-emergence of “timeless classics” seems to be the biggest craze in hospitality décor. Designers such as Charles & Ray Eames, Hans J Wenger and Harry Bertoia have been taking the limelight and the “Emeco 1006” chair has been no stranger to the centre stage! But where does the dubbed “Navy Chair” come from? Popular in television shows such as “The Good Wife” and “CSI”, inspired styles of this chair are appearing in more cafes and restaurants, particularly outdoors, but there must be more to this chair than the fantastic style, surely? In 1944, the founder of Emeco, Wilton C Dinges, was set with a task by the government. To design and manufacture a chair that was strong enough to withstand sea and war conditions on naval battleships during WWII. 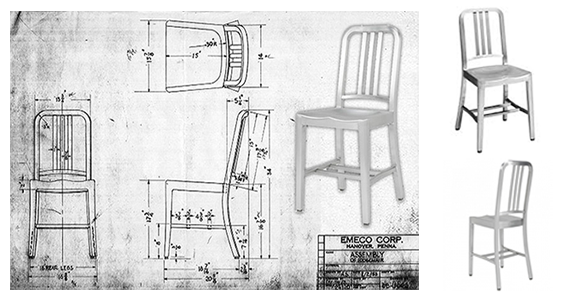 With the technology of machinery rapidly increasing, mass production was an option open to the factory and they produced the Emeco 1006 (pronounced ten-oh-six), using the lightweight material, aluminium. The non-magnetic, ductile metal was the perfect material to use in the conditions that they would potentially be exposed to. For stability on board, eye bolts were applied under the seat to ensure that they could be fastened to the ship deck with the use of cables. This would also ensure that the chairs would remain in place during rough seas and shell blasts. Production of the chair continued after the war and the chairs became popular in hospitals, prisons and government offices as they were easily cleaned and moved around effortlessly. The simple design also meant that they would look stylish in any room, one of the reasons why they became even more popular in restaurants throughout the 1980s and 1990s! A real feature piece with plenty of practicality. The original Emeco 1006 chair has a curved back with 3 vertical struts and a slight curve on the back legs to ensure strength and heavy duty use. The manufacturer’s confidence in the chair is emphasised by the guarantee that they offer, which is up to 150 years. It has even been said that a lot of the chairs that were produced in the 1940s are still in use today! Recent inspired designs often add something a little extra to the contemporary design, for example an extra strut on the back, but the main style of the original is still carried through. 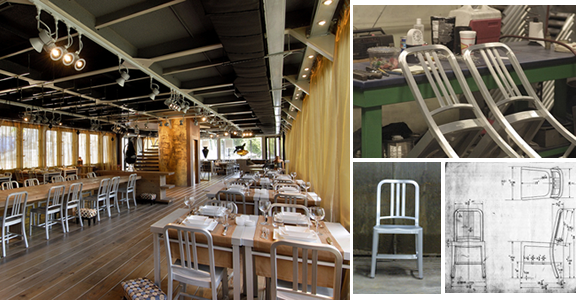 The main material that was used to manufacture these chairs was recycled aluminium. During the Second World War, materials were scarce and in particular metals, so there are traces of other materials such as copper and magnesium that can be found in the original chairs. This shows that durability was the main objective that needed to be overcome to achieve their mission. It’s amazing how much effort went into such a sleek, simple chair. Incredible! Although these chairs were designed and manufactured to “last a lifetime”, I can’t help but wonder if the designer knew at the time that the chair hasn’t only lasted for such a long lifespan due to its brilliant durability, but also due to it’s timeless design! This chair will always be a favourite of mine. I love seeing them on television and it’s a joy to spot them when I am out and about. It is an inspirational piece of heritage and undoubtedly a look that will remain popular and steal the population’s heart for many more decades to come!